AstroMB is a smart astronomical database for scientific research, especially the study of variable stars and other transient phenomena. It's a relational database that handles astronomical images and catalogs. It's smart because it can match images and catalogs, doing astrometry and photometry, automatically detecting the differences (intruders and variable objects). AstroMB is also a sky charting program that can drive a telescope and communicate with 3rd party programs supporting Microsoft scripting. AstroMB can work robotically: it can slew a telescope, take images with CCDSoftV5 or MaximDL, solve their astrometry and photometry, and automatically record in its database the variables and intruders it detects. 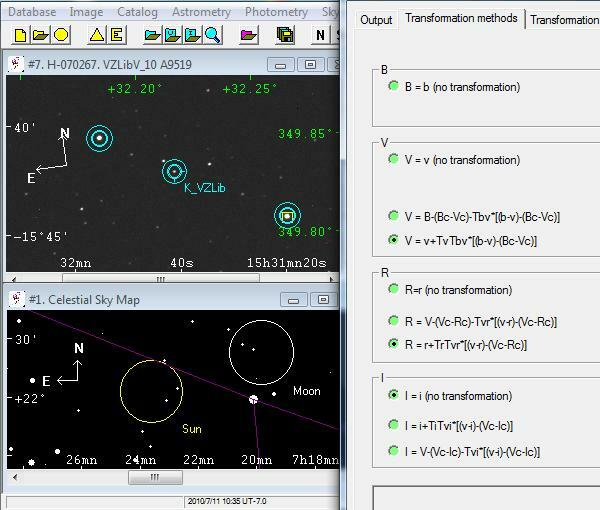 a dialog box to select transformations for photometry. to be automatically alerted for intruders and variables detected on your images.